Burgers. Need we say more? Ok, so we're actually obligated to say more, but even if we weren't, we'd happily continue singing the praises of cheeseburgers. Because cheeseburgers. California Burgers, Juicy Lucys, Barbecue, Buffalo, Sliders, Cheddar, Swiss, onions, bacon... your choices are endless really. And that's not even considering those weird burgers. You know: tofu, elk, and kangaroo. Even if we're just talking classic beef patties, burgers are awesome because you get to decide exactly what suits your tastes when you choose your burger! The cheeseburger came onto the scene sometime in the 20s. We're not exactly sure who came up with it, and at this point, we don't really care. So long as we can have one for lunch... and now we're hungry. Talking about these delicious meat patties slathered in toppings on a bun has actually kind of distracted us. What were we talking about? Right! This costume! Our Adult Cheeseburger Costume is a polyester body with the tunic printed like our favorite grilled sandwich: the cheeseburger. Notice the leafy romaine, tomato, two patties and cheese, sandwiched by a sesame seed bun. You'll look good enough to eat... but we wouldn't do that. Probably. 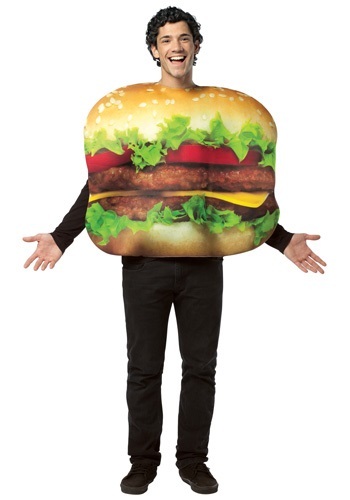 You know, if you wear this around, you might want to bring some fries to throw at people. Just in case you look a little too tasty.